Mondays 12:30-1:30pm, and Wednesdays 11:00-11:50am, or by appointment, in my office, 231 Illini Hall. I'm also happy to answer your questions anytime that I'm not otherwise engaged: before and after class are good times to catch me either in my office or in the classroom. I am committed to affirming the identities, realities and voices of all students, especially students from historically marginalized or under-represented backgrounds. I value the use of self-specified gender pronouns and respect for all persons. Please contact me to receive disability accommodations. You should also know that I'm a mandatory reporter. Homework will be assigned regularly and collected in class, or turned in to my mailbox in 250 AH before the end of class. You are encouraged to work together on the homework, but you should write up your own solutions to turn in separately. If you use two names, put both of them on your homework. Late homework will not be graded; instead I will drop your two lowest scores. Mathematics is something that you learn by doing: doing homework problems and explaining them to each other. If, after thinking about them, you get stuck or have questions, I will be happy to help. You'll have a high probability of doing well in this class by combining all of these resources: classes, textbook, homework, office hours, and discussions with classmates. Two in-class midterms are scheduled for February 22 and April 5. Each exam will be technically comprehensive but emphasizing recent material up to the most recent graded and returned homework assignment. The final exam will cover important topics of the whole course, emphasizing recent material somewhat. The final exam is 7:00-10:00 p.m., Tuesday, May 7 for Section B13, and 1:30-4:30 p.m., Friday, May 3 for Section C13. Make-up exams will be given only for medical or other serious reasons, and arrangements should be initiated by you as soon as possible. You must work completely on your own during exams and quizzes. My exams are fair and similar to homework, so as long as you use the resources provided, you should be fine. If you have difficulties or fall behind in the course, please come talk to me. There will probably be a curve for the semester letter grades; 90% would be the highest cutoff for an A-, 80% for a B-, and so on. If you are near a cutoff, I take your attendance and lecture participation into account. Math 241 or the equivalent. We will use topics from calculus, such as geometric series, improper and double integrals, and changes of variables. HW #0, due by 5pm the first Friday of classes: please send me an email introducing yourself: for instance, what name you prefer to be called, your major and hobbies, why you're interested in probability, or anything else you want to share or have questions about. It would also be helpful to attach a photo of yourself to help me connect your face with your name. HW #1, due by the end of class on Friday, Jan. 25 (in class or in my mailbox in Altgeld 250): Ch. 1 (pp. 15ff): 12, 18, 24, 27, and Ch. 2 (pp. 48ff): 2, 3, 5, 7, 8, 9, 12, 17, 18, 20. Note: please write your section number or section time at the top of your HW. Note: there will be a quiz in class on February 15, one week before the first midterm. The quiz will cover all of the HWs that have been graded and returned beforehand. If you do well on the quiz, it will replace one of your low HW scores; if not, I'll drop the quiz. Make an outline with definitions and techniques from each section. After that review, you will benefit from re-working homework problems, in-class examples, and the practice midterm, because then you will have an improved mental framework to fit the problems into. No HW due on the day of the midterm. Midterm 1 covers homework problems up through and including HW #4 and lectures through Feb. 18. This means that the material in sections up through early Chapter 4 material will be examined more thoroughly than the material in later Chapter 4 sections, e.g., 4.6-4.8 (for which you are only responsible for the things from lectures). Homework problems on 4.3-4.6 will be on Midterm 2. Important note: If you want to turn in your homework during class and you're unable to stay for lecture (which is fine, because I don't make attendance mandatory, as you know), then please turn your HW in to my mailbox in Altgeld 250. Also please write your section number or time on your HW. There will be guest lecturers on 3/6 (Partha Dey), 3/8 (Lee DeVille), 3/13 (Dey), and 3/15 (Richard Sowers) because I have two conferences at which I'm giving talks about my recent statistical mechanics research. The guest lecturers will teach Math 461 at the usual time and place. I will have office hours on Mondays as usual, but my office hours on Wednesday 3/6 and 3/13 are cancelled. Please feel free to email me questions. I'm posting W/F lecture notes early these two weeks. Please turn in HW as usual, i.e., in class or in my mailbox, both of which the guest lecturer will take care of. For logging in to see your scores, click the Score Reports link at https://math.illinois.edu/academics/courses/spring-2019-course-webpages. HW #9 due Friday, April 12 by the end of class: Ch. 6: 14, 20, 21, 22, 23, 27, 29, 33. Also, the last problem from Midterm 2: what is the pdf of X^2 if X is exponential with rate 4? Hint: compute the cdf of Z = X^2 by setting up P(X^2 < = a) and using algebra inside the parentheses to get an expression with X alone. Then use the pdf of exponential in the correct integral, paying careful attention to the bounds. Please do not turn in HW to my office; instead turn it in to my mailbox, and if you're turning it in at 11am, please put it into the mailbox of Peixue Wu (for section B13) or Shufan Mao (for C13). HW #10 due Friday April 19 by the end of class: Ch. 6: 38, 40, 41, 42, 48, and Ch. 7: 5, 6, 7, 8, 11. Annoucement: There is no class on Monday, April 22, and no office hour. HW #11 due Friday April 26 by the end of class: Ch. 7: 19, 21, 30, 31, 33, 38, 39, 41, 50, 51, 56. 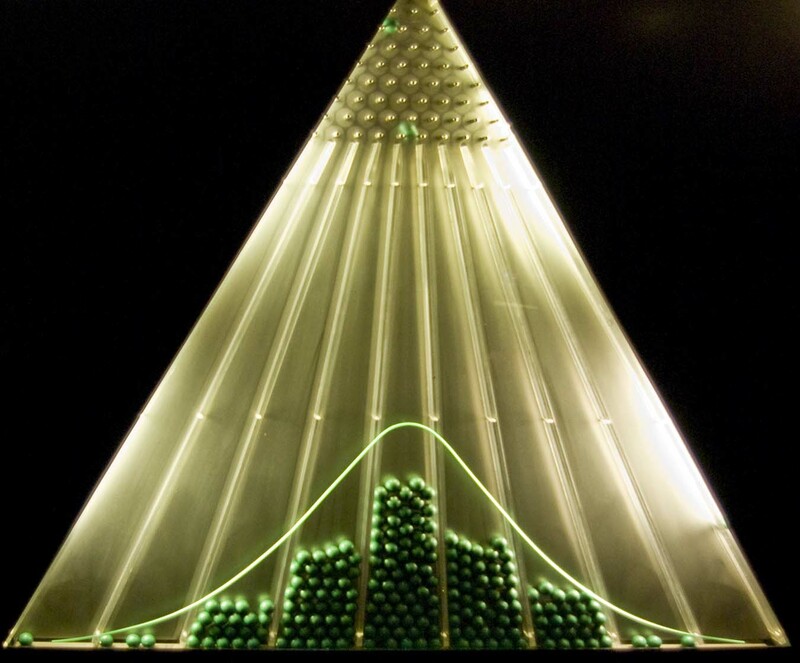 Introduction to mathematical probability: includes the calculus of probability, combinatorial analysis, random variables, expectation, distribution functions, moment-generating functions, and the central limit theorem. We will cover most of the material in the first eight chapters of the textbook. Two main reasons: uncertainty and complexity. Uncertainty is all around us and is usefully modeled as randomness: it appears in call centers, electronic circuits, quantum mechanics, medical treatment, epidemics, financial investments, insurance, games (both sports and gambling), online search engines, for starters. Probability is a good way of quantifying and discussing what we know about uncertain things, and then making decisions or estimating outcomes. Some things are too complex to be analyzed exactly (like weather, the brain, social science), and probability is a useful way of reducing the complexity and providing approximations. And the reason I study probability: statistical mechanics, which combines both the uncertainty of quantum mechanics, and the complexity of zillions of particles interacting. Week 1: Introduction, sections 2.2-2.4 (including Chapter 1 as needed) Wk 1 Monday lecture notes, Wk 1 Wednesday lecture notes, Wk 1 Friday lecture notes. Week 2: Sections 2.4-2.5, 3.2 (including Chapter 1 as needed) Wk 2 Wednesday lecture notes, Wk 2 Friday lecture notes. Week 3: Sections 3.3-3.4 (including Chapter 1 as needed) Wk 3 Monday lecture notes, No class, Wk 3 Friday lecture notes. Week 4: Sections 4.1, 4.2, 4.10, 4.3 Wk 4 Monday lecture notes, Wk 4 Wednesday lecture notes, Wk 4 Friday lecture notes. Week 5: Sections 4.3-4.6 Wk 5 Monday lecture notes, Wk 5 Wednesday lecture notes, Wk 5 Friday lecture notes. Week 7: Sections 5.1-5.3, Wk 7 Monday lecture notes, Wk 7 Wednesday lecture notes, Wk 7 Friday lecture notes. Week 8: Sections 5.4-5.7, Wk 8 Monday lecture notes, Wk 8 Wednesday lecture notes, Wk 8 Friday lecture notes. Week 9: Sections 5.7, 6.1, Wk 9 Monday lecture notes, Wk 9 Wednesday lecture notes, Wk 9 Friday lecture notes. Week 11: Sections 6.2-6.5, Wk 11 Monday lecture notes, Wk 11 Wednesday lecture notes, Wk 11 Friday lecture notes. Week 12: Section 6.5-6.6, review, Midterm 2 on April 5 Wk 12 Monday lecture notes, Wk 12 Wednesday lecture notes. Week 13: Sections 7.2-7.3, 7.7, 7.4 Wk 13 Monday lecture notes, Wk 13 Wednesday lecture notes, Wk 13 Friday lecture notes. Week 14: Sections 7.4-7.7 Wk 14 Monday lecture notes, Wk 14 Wednesday lecture notes, Wk 14 Friday lecture notes. Week 15: Sections 8.2-8.3 (No class Monday.) Wk 15 Wednesday lecture notes, Wk 15 Friday lecture notes.